Raising your kids bilingual in a country where speaking one language is the norm is not always a piece of cake. That’s why there’s nothing better than a good, effective bilingual parenting tip, trick, or hack to make raising a bilingual kid that much easier. The Tip to Skip: Going out of the way to repeat everything twice, once in each language, as a language teaching method. First of all, there’s nothing wrong with occasionally repeating something in both languages, and sometimes there are practical reasons to do so. For example, in families where there’s one English-speaking and one bilingual parent, the bilingual parent may need to repeat crucial information to their child in the heritage language and then repeat it to their spouse in English so everyone is on the same page. Such practical situations are not what we’re talking about here. Why skip this tip as an everyday language teaching method? Children prefer to listen in their dominant language. So, if they know that everything will be repeated in both languages, they will listen in their dominant language and tune out their non-dominant language. In other words, it will simply take twice as long to communicate information. No parent wants that! Also, while it may seem that this method would expose kids equally to each language, if every other sentence is in a different language, then kids won’t get a chance to experience immersion in the heritage language (whereas, kids generally experience plenty of immersion in the majority language of their country throughout their childhoods from school and their community.) There’s nothing wrong with simultaneous translation, but there are more effective and efficient language teaching methods out there, and having heritage-language-only conversations in the child’s life are important for maintaining the language and culture. What is a good substitute for this method? There are many effective methods for raising bilingual children. For example, a popular and effective method for families with one bilingual and one English-speaking adult in the home is One Parent One Language, wherein the parent who speaks the minority language only speaks that language to the child. For families with two parents who are bilingual in the same language, Minority Language at Home is a popular option. The Tip to Skip: Negative consequences if a child does not respond in a certain language and/or repeat back mistakes correctly. First of all, I understand the logic behind this method - after all, speaking a language is good practice. If families have a rule such as “minority language only in the home” and that works for them, that’s great. My recommendation here is to use environmental influences, leading by example, and nurturing the child's self-motivation to maintain a culture of responding in a certain language, rather than negative consequences to keep up that expectation. This is because if punishments are used to compel the child’s responses, this can decrease intrinsic motivation for language learning, and/or create negative associations with that language which are counterproductive for maintaining bilingualism long-term. In fact, use of any external motivators, including rewards to incentivize language use, does not serve to increase the crucial element of internal motivation, and intrinsic motivation is key for keeping up something which requires sustained practice, creativity, and long-term commitment such as gaining and maintaining a second language until adulthood. Before delving further into this topic, some background information about typical childhood language acquisition is in order: Almost all kids raised in an English-speaking country will start preferring to speak English at some point; English will inevitably become their dominant and most comfortable language. Once it becomes easier for the child to speak English, a child will switch to answering in that language if they know they can still be understood. This is because a child’s focus is communicating effectively in the moment. This inclination to speak in whichever language comes most easily is a part of typical language development, and the most effective way to deal with it is to find clever workarounds, not to attempt a (potentially uphill) battle of wills against it. Four important elements are required to gain and maintain a language: exposure, need, positive attitude, and fun. While requiring children to respond in a certain language, with no reason other than fear of reprisal, may increase exposure, doing so at the expense of positive attitude can end up making the cons outweigh the pros. Having a positive attitude towards a language may seem like a small, fluffy detail, but in fact, it literally helps kids remember the language!. Cultivating a positive attitude towards a language leads to long-term motivation to keep it up; creating a negative or punitive association with the language can lead the child to reject and ultimately forget the heritage language. Also, it’s not possible for a person to *force* another person to speak a certain language anyway. First, there are ways that you as a parent can cultivate an environment where your child is expected to answer in the heritage language. Parents can consistently keep up speaking the heritage language to the child, regardless of whether the child responds in English, possibly with a gentle reminder to keep going in the heritage language if they seem to have slipped into English absentmindedly. If a child is speaking in the heritage language and they slip into English because it seems that they came across a word they only know in English, translate the word into the heritage language for them with minimal interruption to the flow of the conversation. Another way to create an encouraging atmosphere is to refrain from teasing the child if they make an error in the heritage language. Next, remember what I was saying earlier about exposure, need, positive attitude, and fun being necessary elements in place to learn a language? "Need" is an often overlooked and undervalued aspect here, so make sure your child has a true need to consistently speak in the language. This involves regularly surrounding the child with people who are dominant speakers of the heritage language, such as relatives and babysitters. Other ways to create a need to use a language in your child’s life include video chatting with relatives who live abroad, sending children to an after-school heritage language program, or any class (art, music, dance, etc.) that happens to be in the heritage language. Likewise, try taking a family trip to an area where that language is spoken, or go places that you would attend anyways, such as a religious service, in your heritage language. Think outside of the box to put your family in situations where the heritage language is needed! For tips on making language learning fun, such as playing games and singing songs in the heritage language, check out part 3 of the post How to Raise a Bilingual Child. Also, some children, especially older children, may be receptive to learning about the benefits of being bilingual, for instance, having a “secret code” to speak in, or access to more music and films. This can help them understand why responding in the heritage language is so important for practice, and thus help them stick with it. If you’re raising your child bilingual- or even just exploring the idea - you’ve probably come across the phrase “One Parent One Language”. This is a popular method where one parent speaks English to the child all the time and the other speaks the heritage language to the child all the time (and of course, the parents speak English with each other). There is also a variant that I call “Strict One Parent One Language,” which refers to a situation where two parents are fluent in the same languages, and one parent speaks English to both the other parent and to the child all the time, and the other parent speaks the heritage language to both the other parent and to the child all the time. Unfortunately, the idea of “One Parent One Language” is often misinterpreted. Taking it to mean that this is the way you must implement bilingualism, or that this is the only effective way to raise a bilingual child. The truth is, there are many potential effective methods for raising a child. (Again, for more details on different such methods, please see part 2 of the post How to Raise a Bilingual Child.) Each family has unique circumstances that would make a different method, or a combination of methods, most effective for them; that’s why it’s so helpful for some families to consult with a bilingual parenting expert to figure out a method and plan for their specific family. Some parents take the phrase “One Parent One Language” to mean that if the child hears the parent speaking any language other than “their” language that it will be harmful or confusing to the child in some way. Fortunately, that misperception is completely untrue. Children are very adaptable, and they assume that whatever situation is in front of them (whether it’s monolingualism, bilingualism, multilingualism, etc.) is normal. 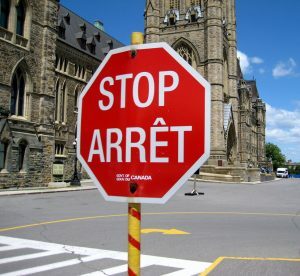 For a closer look at misperceptions surrounding potential confusion, please see the post Dispelling Confusion About "Bilingual Confusion." The Tip to Skip: Overusing direct instruction materials (such as flashcards, language learning DVDs, and interactive language learning computer programs) as language learning tools with very young children under age five. Children ages birth to five learn best through human interaction and real-life situations. Also, pre-school age children and younger have the amazing ability to learn language from overhearing it (a skill that declines as children get older.) Taking all this into account, having a young child exposed to the minority language in more naturalistic settings (such as hearing caregivers speak to them or in front of them in the minority language) is the way to go, if at all possible. Tools of direct instruction have their place, and if a child is going to, for example, be using an app anyways, it can only be a positive thing to have that app be a language-teaching one. Yet if preschool age children or toddlers are learning individual words without context and absent social interaction, it may be hard for them to effectively absorb and integrate that language knowledge. Language learning tools that involve direct instruction such as flash cards and computer programs are best for children elementary school age and up, and there’s no need to go out of your way to use them earlier than that.